The Nintendo Wii is very popular gaming console. When purchasing for the first time you may be interested in finding the the best wii bundle packages. The basic Wii bundle used to come with the game console one Wii remote and one nunchuck along with Wii Sports and Wii Sports Resort. 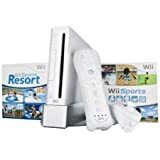 The games, Wii Sports and Sports Resort, have since been replaced in the Wii bundle with a Wii wheel and Mario Kart. This makes the Wii base bundle a much more appealing bundle than before, and for less than $180. The Wii is primarily available in black or white models. There is also a limited quantity of red or blue Wiis available, if you can still find them. The red Wii comes with Super Mario Brothers and Wii Sports for games, but no Wii wheel. The red Wii bundle is prices just over $200. The blue Wii is available for under $160, but be wary of this Wii, it is not the best wii bundle package available. The blue Wii has not GameCube ports so is not able to play GameCube games as well as some Wii games, like Dance Dance Revolution with full functionality. The best Wii bundle packages will be ones that include some extras. The basic Wii components listed above are pretty standard, basically the game console and a controller. Mario Kart does improve the bundle appeal over the inclusion of Wii Sports and Wii Sports Resort. One of the main appeals to the Wii is group play. The Wii console can handle up to four remotes, yet the base package only includes one. 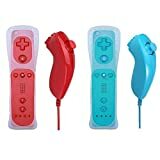 Additional Wii remotes and nunchucks are available and will run around $50 together, for the Nintendo brand. Third party controllers are available and can sometimes be found bundled with the base Wii bundle so you can get two controllers to start. When considering a Wii controller be sure that it includes the Wii motion, or at least supports adding it. Another accessory to consider when looking at the best wii bundle packages is the Wii Fit Plus software and Balance Board. The Balance Board allows for the users feet to get in on controlling the games as well, but it is probably most popular for it's use in exercising. This accessory is going to run about $90. As stated earlier the bundles straight from Nintendo tend to only be the Wii console, one remote with nunchuk and some games. For the best wii bundle packages you'll be looking for a third party that has put the bundle together for you. This could be either online or in a physical retail store. Even some of the TV shopping networks may put together a nice bundle of wii components to create a nice bundle. The best wii bundle package for a starter system is going to be the basic bundle with one extra remote and nunchuk. Expect to pay about $230 dollars with this bundle but hunt for it cheaper. The Wii U is the new home games console from Nintendo. We're expecting it to be released in 2012 and we're rather looking forward to it! Are you thinking of getting a Nintendo Wii or Wii U for kids to use? Let's look at how children can use the Wii and Wii U for games, fitness, drawing, music and more.